How do children internalize the dementia of a beloved family member and what can we do to help them connect and understand the process? 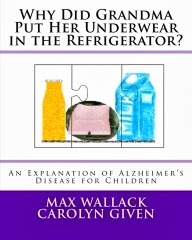 Max Wallack, a gifted young writer, offers wonderful insights in his new book, “Why Did Grandma Put Her Underwear in the Refrigerator?” Max is a philanthropist, Alzheimer’s advocate, and college student in neuroscience and psychiatry. His great-grandmother had Alzheimer’s and Max helped care for her when he was growing up. I was so impressed by the book that I asked Max to share more of his insights. Q. Why is it important to talk to children about Alzheimer’s when a relative or close friend is going through the disease? A. You want to allay the child’s fears so they can continue to have a loving relationship with their relative or friend. Q. What was most confusing to you as a child? Q. As a child, what were the gifts you brought to your family and to your great-grandmother? A. Her whole life, my great grandmother loved being with children. Being with me gave her great pleasure, even up to the last few days of her life. Q. In general, how can children add to the caregiving process? A. Just being there can make a difference. Sometimes adult caregivers need a few minutes for themselves. Perhaps they need to cook a meal or take a shower. Even a young child could alert a caregiver if the person who has Alzheimer’s wanders outside or gets into some obvious trouble. Q. 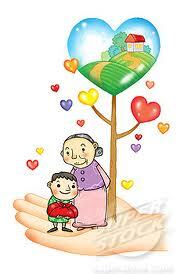 How does being part of a caregiving family benefit children? A. I developed a very early sense of responsibility and empathy. I know of other young caregivers who have a sense of caring and responsibility beyond their years. Their parents don’t thrust this responsibility upon them; rather, it is developed as they learn empathy. Children have a natural tendency to want to help. Parents should allow them to participate in the caregiving and not shield them from what is happening. Q. What kinds of support do children need? Q. Anything else you’d like to include? A. People with Alzheimer’s disease are still the same people you have always known. They are “more there” than meets the eye. The trick is to find a means of communicating with them. The creative arts represent a great means of connection, since the area of the brain involved in creativity is one of the last areas affected by the disease. Max Wallack’s journey with his grandmother helped him identify his calling. 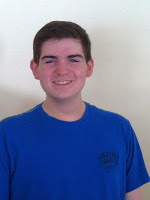 He is a student at Boston University and a Research Intern in the Molecular Psychiatry and Aging Laboratory in the Department of Pharmacology and Experimental Therapeutics at Boston University School of Medicine. He is also the founder of PUZZLES TO REMEMBER. a project that provides puzzles to nursing homes and veterans’ institutions that care for Alzheimer’s and dementia patients.